Islamabad (Agenzia Fides) - "Police must arrest Qari Mohammad Salim and the two Muslim women who invented false accusations of blasphemy against Asia Bibi, an innocent Christian who spent 9 years in prison": says to Agenzia Fides Taskeen Khan, Human rights activist in Pakistan, who adds: "It is time the state corrects this abuse, otherwise it will continue with impunity". In Pakistani civil society, human rights activists, organizations and communities of different religions have begun to talk about mass media and social networks against the misuse of the blasphemy law in Pakistan. Babar Ayaz, a Muslim, writes after the acquittal of Asia Bibi: "I praise the judges of the Supreme Court for taking a courageous stance against the misuse of the blasphemy law. Before Zia-ul-Haq, former president of Pakistan, extended the application of the blasphemy law, there were very few cases of complaints in the country". The blasphemy law that exists today, Article 295 of the Penal Code prohibits harming any place of worship or a sacred object. Article "295 a" prohibits to offend religious sentiments; "295 b" punishes contempt for the Koran and "295 c" forbids slandering the Prophet Muhammad. 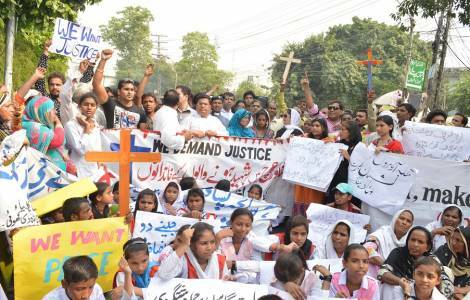 Catholic activist Rashid Gill, coordinator of the "Justice and Peace" Commission of Major Superiors in Karachi, told Fides: "It is sad to see that, for personal reasons, the blasphemy law is invoked and abused. This is the case of Asia Bibi’s family, whose family members were torn apart and are at risk of death". And he continues: "We demand that false ascertained accusers are given the same punishment inflicted on the blasphemer, in every single case of alleged blasphemy. This will be the only way to stop the abuse of the blasphemy law". Last March, the Pakistan Senate Human Rights Commission proposed amendments to the law to punish false accusers, suggesting that the same punishment is to be imposed for those who break the law. Currently, according to the Pakistani Penal Code (PPC), those who register a complaint with false statements face up to seven years in prison and a fine of 200,000 Rupees (1330 euros). The Senate Commission proposes to tighten these sentences. In the Senate, the provision did not pass due to the opposition of the Islamic political party Jamiat-Ulema-e-Islam Fazl (JUI-F), that asked to send the text of the bill to the Council for Islamic ideology for ratification. In 2010, the Council recommended some amendments, urging the government to "take appropriate administrative, procedural or legislative measures, to stop cases of abuse of the blasphemy law", but saying they were against the repeal of the law. The Council suggested, among other things, to make it mandatory for the complainant to produce concrete evidence to support the allegations, to have the cases of alleged blasphemy judged by the High Court (second instance court) and not by the courts of first instance.